Myocarditis is a focal or diffuse inflammatory disease of the myocardium. Prevalence of arrhythmia associated with myocarditis has been reported as merely 18%. These arrhythmias include new-onset atrial or ventricular arrhythmias or high-grade Atrioventricular (AV) block while some of these arrhythmias may be life-threatening. Several cases of AV block during myocarditis course have been reported[3,4]. Sinus arrhythmias in myocarditis are uncommon. Only one case of recurrent sinus arrest lasting for 8 seconds in a patient with Lyme carditis had been reported. 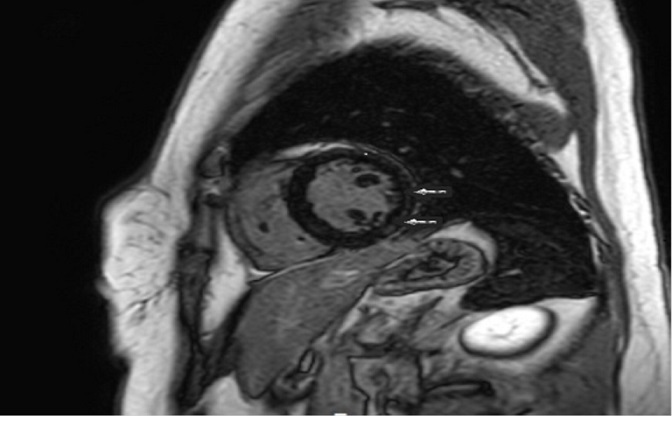 Here, we report a case of acute myocarditis presenting with syncope related with recurrent sinus arrest. A 33-years-old female patient was referred to our clinic for further investigation of her syncope. The patient described fever and flu-like symptoms for the last 3 days. Her physical examination was normal, with blood pressure 120/80 mmHg, heart rate 52 bpm and body temperature 37.1°C. Chest-X ray was normal. Electrocardiogram (ECG) revealed abnormal intraventricular conduction, first degree AV block and inverted T waves in leads I, II, III, a VF and V3-6 (Figure 1A). Echocardiographic examination showed normal left ventricular systolic function with ejection fraction 60% and mild pericardial effusion. Her blood tests on admission were as follows; White Blood Cell count (WBC) 11.91 10e3/μL (normal range 4.4 - 11.3 10e3/μL), haemoglobin 12 g/dL (normal range 11.7 - 16.1 g/dL), platelet count 175 10e3/μL ( normal range 152 - 1396 10e3/μL), urea 38 mg/dL (normal range 16.6 - 48.5 mg/dL), creatinine 0.5 mg/dL (normal range 0.5 - 0.9 mg/dL), glucose 83.5 mg/dL (normal range 74 - 109 mg/dL), sodium 130 mmol/L (normal range 136 - 145 mmol/L), potassium 4,3 mmol/L (normal range 3.5 - 5.1 mmol/L, creatine kinase (CK) 301 (normal range, 26 - 192 U/L), Creatine Kinase-Myocardial Band (CK-MB) 83 (normal range, 7.2 μg/L) and Troponin-I (Tn-I) 4.2 μg/L (normal range, < 0.0,23 μg/L), serum C-Reactive Protein (CRP) 25.8 mg/L (normal range < 5mg/L). Immunological and serological investigations including ANCA and ANA tests, Lyme serology, thyroid function tests and viral serology were normal. Figure 1: ECGs, demonstrating abnormal intraventricular conduction (A), sinus arrest (B), accelerated idioventricular rhythm (C). After recording her baseline 12-lead ECG, she developed sinus arrest lasting for 15 seconds while she was still being monitored with ECG (Figure 1B). The patient lost consciousness and a seizure was observed in that period. A new rhythm occurred spontaneously and no intervention was made. Cardiac medications such as atropine or ephedrine were not used to enhance rhythm. New 12-lead ECG showed accelerated idioventricular rhythm (Figure 1C). The patient was immediately transferred to catheter laboratory for temporary pacemaker implantation. While being transferred, sinus pause episodes recurred. Temporary transvenous pacemaker lead was implanted via left femoral access but desirable lead positioning could not be achieved. Meanwhile total AV block was monitored. Ongoing efforts for appropriate positioning of the current lead were helpless so another temporary pacemaker was implanted with right jugular vein access. Confirming the appropriate position and function of the second lead, the first lead was withdrawn. 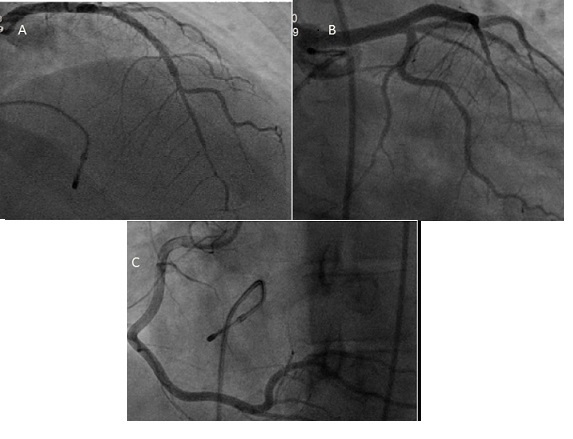 Thereafter, coronary angiography was performed and normal coronary arteries were documented (Figure 2A, 2B, 2C). She was transferred back to coronary care unit with temporary pacemaker support. 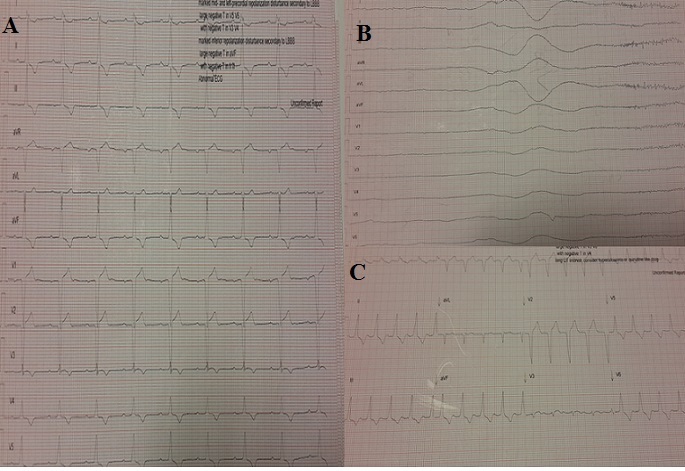 Temporary pacemaker was switched-off and repeated ECG showed total AV block (Figure 3A). Figure 2: Coronary angiographic images (A, B, C) of patient. On the second day of admission, the patient was on sinus rhythm (Figure 3B). Intermittent, short-lasting pacemaker rhythms were noted on bed-side monitor recordings. No pacemaker rhythm was observed after the third day of admission. Antibiotics or anti viral medications were not provided. Her blood tests on the second day were as follows; WBC 8.61 10e3/μL, haemoglobin 12.3 g/dL, platelet count 160 10e3/μL, urea 33 mg/dL, creatinine 0.6 mg/dL, glucose 80.5 mg/dL , sodium 135 mmol/L, potassium 4,5 mmol/L. Levels of myocardial biomarkers and CRP began to decrease (CK:106U/L,CK-MB:14ug/LTn-I: 0.22 μg/L, CRP 19 mg/L). 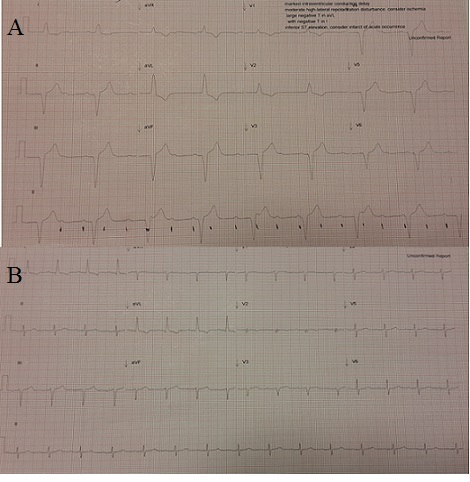 Figure 3: ECGs, demonstrating total AV block (A), sinus rhythm (B). The patient was scheduled for Electrophysiological Study (EPS) on the fourth day of admission. EPS results were not suggestive for permanent pacemaker implantation. First degree AV block (suprahisian localization) was recorded. Temporary pacemaker was withdrawn and Cardiac Magnetic Resonance Imaging (CMRI) was scheduled. CMRI showed subendocardial enhancement in lateral and inferior ventricular walls, highly consistent with acute myocarditis (Figure 4). The patient was discharged after normalization of ECG, laboratory tests and echocardiographic examination on the sixth day of admission. She was asymptomatic in at the one-month follow-up visit. Her ECG and echocardiographic exams were normal as well. Myocarditis is an inflammatory disease of the myocardium which may have various clinical presentations ranging from being asymptomatic to sudden cardiac death. Arrhythmias associated with sudden cardiac death are usually ventricular arrhythmias (such as ventricular fibrillation). Myocarditis cases presenting with total AV block and syncope had been reported before[3,4]. However, sinus arrhythmia in myocarditis is extremely rare. There is one case of Lyme myocarditis presenting with sinus pause for 8 seconds in the literature. Another case series including 20 children with sick sinus syndrome detected myocarditis in 2 of the patients. Our patient suffered different consecutive rhythms including repetitive sinus arrest (the longest one lasting for 15 seconds), accelerated idioventricular rhythm, and total AV block. Although our patient had both sinus and ventricular arrhythmias, she had normal left ventricle systolic functions and CMRI revealed enhancement in a limited myocardial territory. Nevertheless, we were able to perform CMRI after withdrawal of temporary pacemaker and acute phase of the disease. Hence, more extensive enhancement could be visualized if it could have been performed earlier. Prompt identification and treatment of life-threatening arrhythmias associated with myocarditis may be life-saving by close monitoring of patients with myocarditis. 1. Wu, Lin-Lin, Han, B. Diagnosis and treatment of myocarditis. (2014) Zhongguo Dang Dai Er Ke Za Zhi 16(12): 1283-1288. 2. Blauwet, L.A., Cooper, L.T. Myocarditis. (2010) Prog Cardiovasc Dis 52(4): 274-288. 3. Akashi, R., Kizaki, Y., Kawano, H., et al. Seizures and syncopedueto complete atrioventricular block in a patient with acute myocarditis with a normal left ventricular systolic function. (2012) Intern Med 51(21): 3035-3040. 4. Caughey, R.W., Humphrey, J.M., Thomas, P.E. High-degree atrioventricular block in a child with acute myocarditis. (2014) Ochsner J 14(2): 244-247. 5. Franck, H., Wollschläger, H. Lyme carditis and symptomatic sinus node dysfunction. (2003) Z Kardiol 92(12): 1029-1032. 6. Radford, D.J., Izukawa, T. Sick sinus syndrome. Symptomatic cases in children. (1975) Arch Dis Child 50(11): 879-885.